Flight marks Robert Zemeckis’ (of Back to the Future fame) return to live action directing after only working on animation/CGI projects since Cast Away in 2000. As he is most famously known for light hearted projects such as Back to the Future, Polar Express and A Christmas Carol Zemeckis may seem like an odd choice for such a deep story with several difficult and challenging themes to tackle, so would he be able to rise to the challenge? 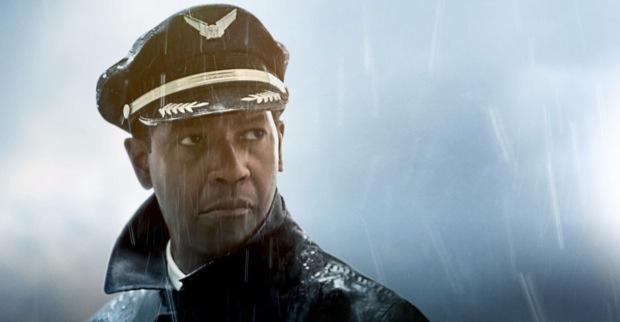 Denzel Washington is Captain William ‘Whip’ Whitaker, a well known and well respected airline pilot. When his latest flight goes awry Whitaker is forced to make a drastic choice and crash the plane into an empty field, managing to save many lives; from this tragedy Whitaker becomes known as a hero. However, an investigation into the malfunctions of the flight reveal that all may not be as it seems. There’s nothing I can say about Denzel Washington’s performance that you wouldn’t expect anyway. He is absolutely flawless as the tragic airline captain and is so enthralling in his performance that you can’t take your eyes off him. Right from the beginning Washington draws you into his character and slowly peels away layers and layers of Whip, allowing for a close examination of his character and all of his vices. While not always likeable there isn’t a moment where you want him to leave the screen because the character is full of complexities and conflict and incredibly well written. And speaking of the writing, Flight is easily the best film I have seen this year in terms of its writing and storytelling and is one of the best written films I have seen in my life. This isn’t a film that is driven by action and there isn’t a lot of action scenes that crop up after the plane crash but that doesn’t matter. Wasington’s character is superbly well written as I mentioned above but so is Nicole (played by Kelly Reilly) who ends up being a wonderful treat really despite the fact I did not have a clue where her story was going or who she was when she first turned up. But then when this was revealed it made it even better. And there is one subtle scene where the plane is coming down over the house of Nicole as she is being pulled away by paramedics which I thought was understated but beautiful. The wonderful acting is not limited to Washington alone. In a cast that features the likes of Kelly Reilly, Don Cheadle, John Goodman, Brian Geraghty and Bruce Greenwood it’s impossible to expect anything less. Every member of the cast does more than hold their own with John Goodman and one line from Greenwood in particular providing some much needed laughs into a drama heavy production. Goodman’s brief appearances are a joy to behold and while I would have liked to have seen more of him it is probably for the best that he came in small doses. The filming of the crash is superb. The in-depth analysis of the characters is fantastic and how it deals with the aftermath of such a tragic event is really well done. Flight is absolutely superb, a fantastic piece of drama. Unfortunately for Washington he is in a very tough category in terms of Best Actor at the Oscars and the script probably won’t win Best Screenplay but it has my vote!